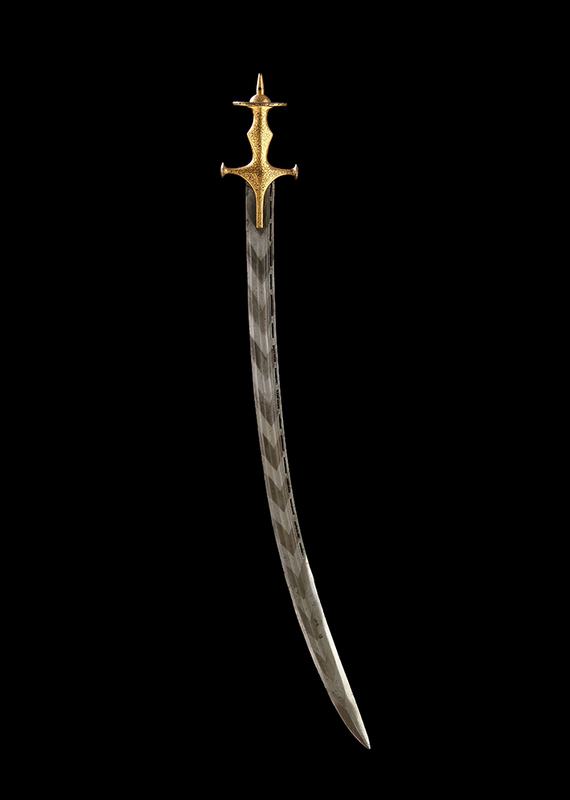 Perhaps the most eye-catching aspect of this tulwar is the complex, curved singled-edged blade. Made with alternating, pre-shaped billets of watered steel and mild steel, it has been arranged to display a chevron pattern from forte to foible. Beautiful and rare, this pattern is understandably coveted by collectors. And the sword’s benefits don’t stop there, for its wide, sweeping blade boasts another exceptional feature: Tears of the Wounded. These ‘Tears’ are small ball-bearings captured inside seventeen rectangular slots near the blade’s spine. It is generally accepted that this is a decorative feature, showing off the exemplary skills of the Rajput swordsmiths. The tulwar’s characteristic steel hilt is of the Jodhpuri type and is heavily decorated with gold-damascened foliage with very little loss of this precious material, despite the item’s age. For a similar sword, see Butterfield & Butterfield’s The Dr. Leo S. Figiel Collection of Mogul Arms, lots 2025 and 2029–2031. Provenance: From the collection of Dr. Ravinder Reddy, and illustrated in his newly published book Arms & Armour of India, Nepal, & Sri Lanka – Types, Decoration and Symbolism.